UI Obstetrics and Gynecology provides consultation, treatment planning and inpatient and outpatient care for a comprehensive range of general and specialty obstetrics and gynecology services for all stages of a woman’s life. We provide pre-pregnancy and pregnancy care for all women ranging from centering pregnancy with a midwife through high-risk pregnancy care. We also offer assisted reproductive care. We provide gynecologic services that include a range from well woman visits through gynecologic oncology including fibroids, infertility care , menopause, PMS, polycystic ovary syndrome (PCOS), urogynecology and pelvic reconstruction surgery, and vulvar vaginal diseases. 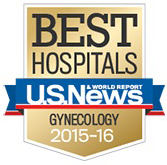 Our nationally acclaimed faculty sees patients in both clinics and as private patients. Kimberly Leslie, MD, chair and departmental executive officer for the UI Carver College of Medicine Department of Obstetrics and Gynecology, was elected to the National Institutes of Health (NIH) Council on Councils, a 27 member board that advises the NIH Director. Thomas Gellhaus, MD was named President elect of the American Congress of Obstetricians and Gynecologists. Bradley Van Voorhis, MD was named President of the Society for Advanced Reproductive Technology, the nation's primary organization of professionals dedicated to the practice of ART. Our physicians are active in all arenas from local to international and have received recognition of their efforts. Noelle Bowdler, MD, was selected to receive the 2015 College of Medicine Faculty Service Award for service to the College of Medicine, UIHC, state and national levels. Eugenia Mazur, MD was recognized as 2015 Outstanding Educator by the University of Iowa Carver College of Medicine.